A little-noticed but important legal battle recently wrapped up in California this week. A loose collection of millionaires and billionaires including David Welch, Eli Broad, Charles Schwab and the Fischer family (owners of the Gap, among others) have been attempting for years to eliminate not only protections for teachers in California, but to also drastically reduce funding for public education. In 2012 they spent millions in a failed attempt to defeat California’s Proposition 30, a measure to moderately increase education funding after drastic cuts, as well as to pass Proposition 32, a deceptive ballot measure that would have prevented labor unions from spending money in elections while allowing free rein to for-profit corporations. The latest effort from the same coalition, this time organized under the name Students Matter, was a lawsuit known as Vergara v. California. The suit alleged that tenure rules for California teachers constitute a civil rights violation against students–under the specious reasoning that if a judge can be convinced that a few children received a subpar education from a tenured teacher, then therefore the civil rights of all children in California are being abused and job protections for teachers should be eliminated. The motives of those magnates who brought the suit have little to do with protecting children, and everything to do with destroying significant labor protections in an attempt to turn the teaching profession into the same abusive, revolving-door, at-will wasteland that the Reaganite right and corporate-friendly left have foisted on most of the private sector. It soon became clear after the start of the trial, however, that the presiding judge in the case was strongly sympathetic to the plaintiffs, didn’t really approach the case with an open mind, and ultimately ruled on their behalf without giving any compelling rationales to support the decision. 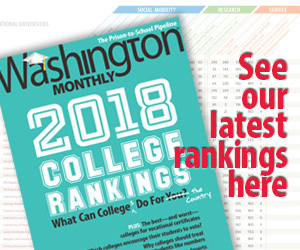 Just a few days ago here at the Washington Monthly, Jill Barshay effectively destroyed the argument that it is even possible to compare between teachers in low-income and high-income schools and determine who is a “good” teacher and who isn’t. The attempt to use test scores to perform that evaluation is particularly discriminatory and ineffective. This week, we needed your leadership; to demonstrate that teacher and student interests are aligned; that we must press—60 years after Brown v. Board—for educational equity; that it takes more than a focus on teachers to improve public education; that, when it comes to teachers, we need to promote strategies that attract, retain and support them in classrooms; and that, of course, removing teachers who can’t do their job in quick and effective ways is important, but so is due process, so teachers can take creative risks that enhance teaching and learning. But instead, you added to the polarization. And teachers across the country are wondering why the secretary of education thinks that stripping them of their due process is the way to help all children succeed. As you said in your statement, we must “increase public confidence in public education.” However, in pitting students against their teachers, the Vergara lawsuit had the opposite effect. Polls show that a vast majority of Americans trust teachers most to improve public education. Why say something that erodes that trust? I’m glad you mentioned the other “inequities in education-including school funding, access to quality early childhood programs and school discipline.” As you know, research shows that these factors contribute to two-thirds of what affects student achievement. Tackling these issues is the paradigm shift we must make happen. The Equity and Excellence Commission Report, which your department released in 2013, made a clear call for concrete investments in our children—investments such as wraparound services, early childhood education and high-quality teacher preparation. The report, however, has gone largely untouched by the Obama administration. The Vergara decision does not address these significant out-of-school factors. Unfortunately, the underpinning of the Vergara decision suggests that if we just remove the small fraction of teachers who are ineffective, all will be solved in public education. While the Vergara lawsuit raises legitimate issues, we should be wary of solutions or judicial rulings that do not take on the broader issues discussed in the commission’s report. The battle between teachers and the wealthy forces hostile to worker protections is going to continue to rage on throughout the appeals to Vergara, and the attempt to extend the subverting of labor rights in one of the nation’s most important professions.